Barbara Whitman, 74, entered into rest May 11, 2009. 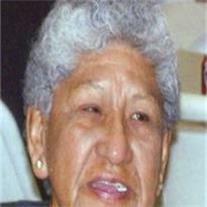 She worked for the BIA as a cook at the Casa Blanca Day School for 37 years. She was preceded in death by her son Laddie A. Baptisto. She is survived by 3 daughters, Cynthia L. Baptisto, Delores E. Tate, Janice G. Whitman, 20 grandchildren, 25 great-grandchildren, sisters Andrea and Jannette Stepp. Services will be held at the family residence, 152 E. Sacaton Rd., Sacaton, Friday May 15, 2009. Rosary will begin at 6:00 PM. Traditional Maricopa cremation ceremony will begin at 9:00 PM. Burial to follow at the East Sacaton Cemetery. Arrangements by Bunker’s Garden Chapel.